I took a look at EURJPY 10 year and 2 year yield spread of German and Japan. It appears that the rally is not supported by the yield spread; however, I read some news that USDJPY has decoupled from its spread along with AUDUSD , so I don't know what to think here about this. EURJPY's yield spread looks better than the yield spread of USDJPY and AUDUSD . (1) Due to the presence of other dominant drivers, currency pairs may not move necessarily in tune with the step of yield spreads: (a) changes in monetary policy , (b) changes in underlying trade and/or exchange patterns (I guess this means imports, exports or a trade war), investor flows or basic balances. (2) Another reason could be skepticism over Japan's yield curve control. It looks the price has pullback into a weekly supply area. Based on this analysis, I believe this is a good opportunity to buy JPY over several weeks, and sell other pairs. So, I have gone ahead and shorted this rally in EURJPY and USDJPY . Comment: So, according to Omkar Godbole, "The EUR could run into offers if Deutsche bank news weighs over banking stocks." He continues to say, "Reports are doing the rounds the European Central Bank has asked Deutsche Bank to calculate the potential impact of winding down its investment banking operations. The German lender has called it a routine exercise. However, the yield spread may drop in the EUR negative manner if Deutsche bank shares react negatively to the news." So, this is something I will start to check out. Weekly trend still up for me though. However, a short term trader can still make money shorting in the neighbourhood of 'B' = 134.37--132.92, targeting 'C' =127.91---125.84 neighbourhood, where I'm interested in Buying from. @moorekapital, Eur is strong at the moment and JPY is neutral. I am not sure if JPY will suddenly pick up strength. 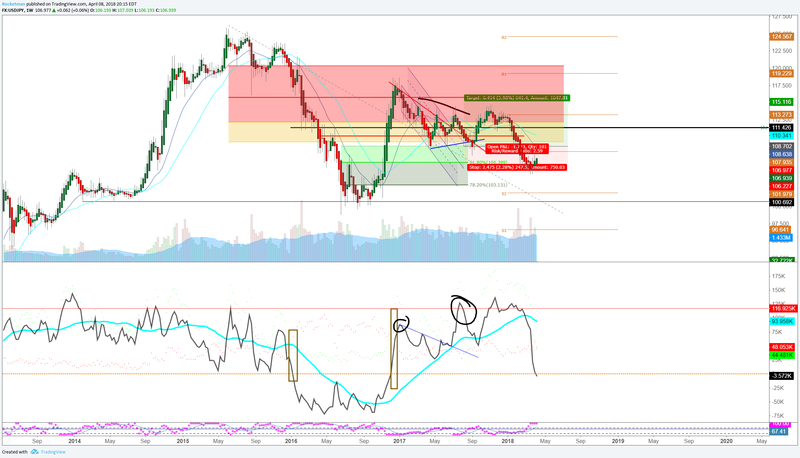 When it does, then I can re-enter short in USDJPY if the conditions are right.